An absolutely stunning Michael Beaudry diamond platinum pendant. The center diamond is a 1.50 carat pear shape, D color, VS2 clarity, as graded by GIA. The double diamond halo mounting for the diamond contains 0.52 carats total. 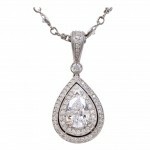 The chain that the pendant is on has 23 diamonds with a total weight of 2.60 carats, all set in platinum. Pendant and chain can be sold separately.